I am so glad to have this opportunity to remember a man who was a great friend of the Festival and whose recent passing has left many in the UK food industry deeply saddened. Charlie’s was not a household name although he was, in a way, a celebrity. Charlie’s fame flowed from a strange, anomalous programme called Veg Talk that appeared in the schedules of BBC Radio 4 somewhere in the early Noughties. Veg Talk was a spin-off of the Food Programme. Sheila Dillon, so the story goes, then the producer of the Food Programme, did a programme about these two cheeky barrow-boys who worked out of Covent Garden and were in and out of the back-doors of all of London’s best restaurants. They were such obvious stars that they were given their own programme. The barrow-boys were Charlie Hicks and Gregg Wallace. Veg Talk was ground-breaking for Radio 4 in so many ways. It was the station’s first – and possibly last – ever phone-in. Charlie and Gregg kept up a relentlessly cheery banter about “what’s up, what’s down, what’s in, and what’s out” in the world of fresh produce. It had a feature called Vegetable of the Week. Quite possibly trailed with a jingle. But it wasn’t and they went on to make nine series. No one was more amazed at this than Charlie. It was during this period that Charlie first came to the Abergavenny Food Festival. He and Gregg did a show in the Borough Theatre incisively titled Talking Vegetables. There were studio guests. There were live vegetables. There were slides of vegetables interspersed with slides of Fanny and Johnny Craddock. There was loads of banter. They were a good team. Charlie did the research and the tech stuff. Gregg got the drinks in. But it wasn’t Charlie’s on-stage appearances that marked his real contribution to the Festival. Somewhere in the Noughties, Charlie left London and moved down to Hay-on-Wye which is where his wife Anna’s family are from. I remember the first time I met him outside the Festival context. It was a winter evening. I was serving behind the counter in Shepherds. Charlie came in wearing a long coat and scarf, looking metropolitan. I was slightly in awe of him. After all he was famous. But in no time we were deep in conversation talking, I think, about why Britain didn’t have a national food culture (it wasn’t busy in the shop). Charlie opened a greengrocer’s shop in Hay having decided that he would leave the restaurant supply business. It was a decision that he later revised but in the meanwhile he was a regular figure in Hay and I had the good fortune to get to know him and Anna. As I soon discovered, Charlie’s knowledge of food was exceeded only by his interest in the subject. Charlie loved to cook and loved a good cookbook. He could tell a good one from a bit of flim-flam. And Charlie loved to eat well and had an unparalleled knowledge of the restaurant business. After all, for many years, it was his job to ring around kitchens and take orders for their next day requirements of fruit and veg. He knew the chefs of course. But more than that. He knew what went on behind the hype. He knew who really did the cooking; he knew who cared about provenance; and he knew who was and wasn’t paying their bills. Over long lunches at his place or ours, Charlie soon became an unofficial sounding-board for who to invite to Abergavenny and it was thanks to Charlie that we had many of our greatest successes. Of course I wanted him to have a word. Cyrus came that year and has not missed a Festival since. 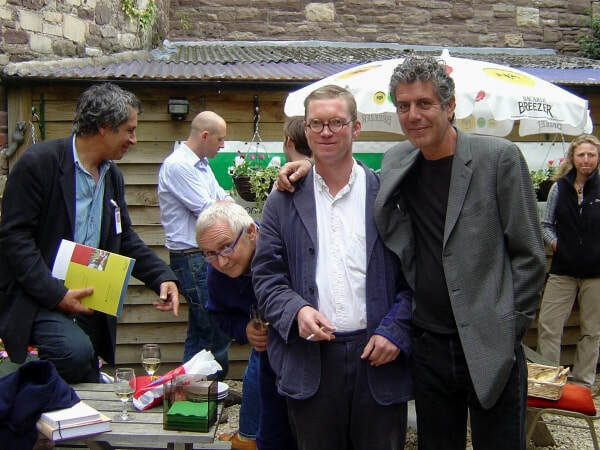 When Anthony Bourdain’s Kitchen Confidential was taking the world by storm, it was Charlie who masterminded the plan to bring its author to Abergavenny. Sure enough Fergus came. Tony Bourdain came too and, icing on the cake, so did AA Gill. As time went on I came to appreciate that Charlie’s knowledge was worn lightly, shared generously, but it ran exceptionally deep. He really did know the business from ‘field to fork’. His father had had a warehouse in the old Covent Garden and he had grown up steeped in the wholesale markets. Over the course of his career he got to know many growers and many chefs and was equally at home in the field and the kitchen. Chefs loved him because not only could he recommend what to buy, he could also discuss how to cook it. And for growers, he was an indefatigable champion of their produce. Charlie was one of the first people to understand the importance of telling the stories behind the produce. His Market Reports from way back in his London days were legendary for their mix of humour and information. And as social media took off, Charlie was quick to jump on board. Soon he was able to add images and clips and communicate across multiple platforms. And by the time he had added video editing to his other skills, he was able to scour the whole wide world of digitalised media in the cause of promoting fruit and veg and the people who grew it. His reports now featured Charlie, in a three-cornered hat and high vis, traipsing along in a clip from Poldark. Charlie in conversation with Hattie Jacques admiring marrows. ‘Ooh. That is a very big one you’ve got there’. Clarkson punching Charlie on the nose because he hadn’t got any new season asparagus. It was fast, it was topical, and it was always funny. Some of Charlie’s more recent Market Reports are still available on YouTube, and if you haven’t already seen it the Total Produce Best of Charlie Hicks shows off some of his more exotic editorial escapades. In as much as it has always been the Festival’s mission to inform as well as entertain, it must be said that in losing Charlie Hicks we have lost a role model.